As noted in my previous post on global patterns of tobacco consumption, manufactured cigarettes remain the main way to consume tobacco worldwide despite the existence of alternative tobacco products such as dry and moist snuff, water pipes, and roll-it-yourself cigarettes. 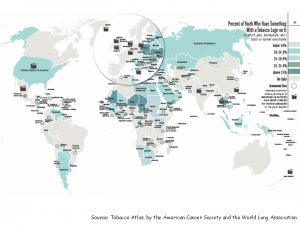 This post focuses on economic implications of cigarette consumption across the world. 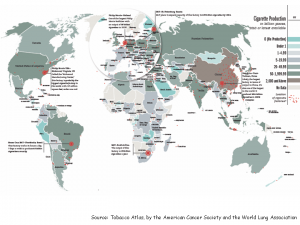 Let’s begin where every cigarette smoked around the world begins—with the tobacco plants. 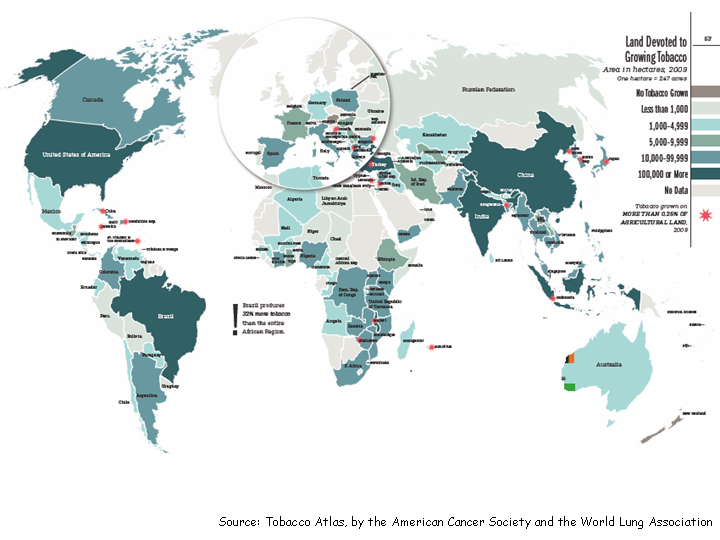 According to the Tobacco Atlas, produced by the American Cancer Society and the World Lung Foundation, “tobacco is grown in 124 countries, occupying 3.8 million hectares of agricultural land. World tobacco production peaked in 1997 at over 9 million tonnes and has since declined by almost a quarter to 7.1 million tonnes in 2009”. 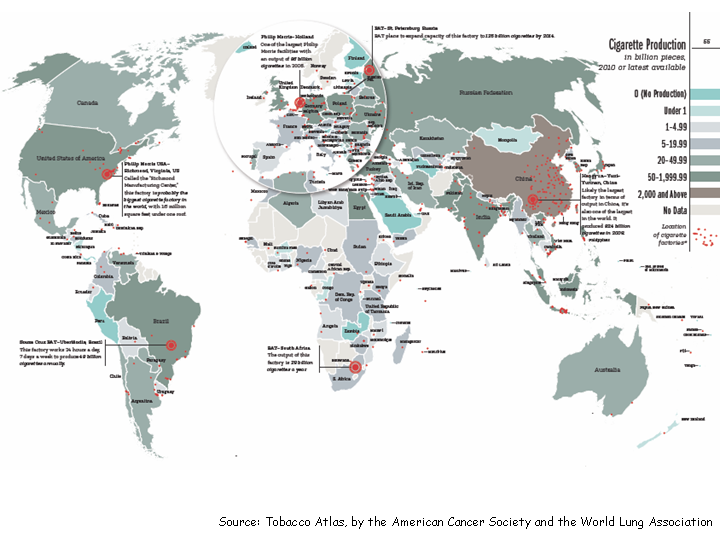 As can be seen from the map, reproduced from the Atlas, tobacco is primarily grown in developing countries, although United States is the fourth largest producer. China grows 43% of the world’s tobacco, more than the other top nine tobacco-producing countries combined. In low- and middle-income countries where land is used to grow tobacco rather than food, tobacco growing is widely viewed as a contributor to undernourishment; in 2009 six of the top ten tobacco-producing countries had undernourishment rates between 5% and 27%. 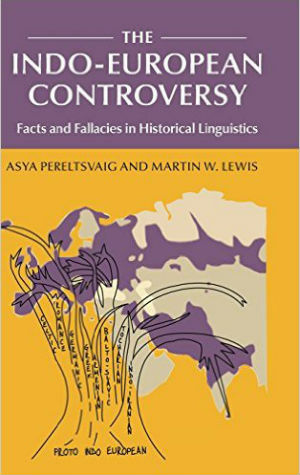 As reported in the Atlas, in impoverished Malawi, each tonne of tobacco leaf produced in 2008 required the use of land that could have produced 14.6 tonnes of potatoes. Tobacco farming also harms the environment. The need for fuel wood in the curing and drying processes leads to the clearing of 20,000 hectares of forestland annually. In addition, tobacco requires the heavy use of fertilizers and pesticides as the plants deplete the soil of many nutrients. Workers are also sometimes exposed to excess amounts of nicotine, which causes “green tobacco sickness”. Despite those environmental risks, tobacco farmers usually receive very little of the profit made. In 2003, tobacco farmers in the United States received less than 1% of consumer spending on tobacco, as most of the revenues went to cigarette manufacturing companies and taxes, as discussed in more detail below. Once tobacco leaves are harvested and dried, they are shipped to cigarette manufacturing factories. Over 500 such factories are spread around the globe, collectively producing nearly 6 trillion cigarettes every year, an increase of roughly 13% over the last decade. In 2010, cigarettes were produced in most countries, at a rate of about a million cigarettes manufactured every five seconds. The largest concentration of such factories is found in China and Europe. Approximately 40% of all the cigarettes produced in 2010 were manufactured in China, followed by Russia (7%), the United States (6%), Germany (4%), and Indonesia (3%). In China, about 24 out of every 100,000 workers are employed in the tobacco manufacturing sector; in Russia, the corresponding figure is 18 out of every 100,000 workers. While China and Russia produce cigarettes mostly for internal consumption, the largest exporters include Germany, the Netherlands, Poland, United States, and Indonesia. Cigarette factories in many countries are typically hidden from sight behind high walls, given vague titles like “manufacturing facility” or “production center”, and serviced by unmarked trucks. In China, however, where smoking is much more socially acceptable than in many other countries, factories are highly visible and prominently featured in their communities. Advances in satellite imaging technology allow such projects as Stanford University’s Cigarette Citadels, directed by Prof. Matthew Kohrman, which now make it possible to pinpoint some 500 cigarette factories worldwide. 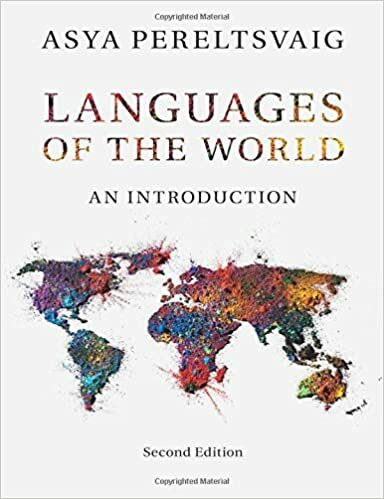 Kohrman’s project also provide basic facts about these facilities, such as what companies own them, when they were built, how many cigarettes they roll out every year, and whether their products are consumed domestically or exported. Most cigarette factories are owned by just a few large tobacco companies, which have consolidated through privatization and mergers in recent years. Five major publicly traded tobacco companies dominate the business: Philip Morris International, Altria/Philip Morris USA, Japan Tobacco International, British American Tobacco, and Imperial Tobacco. In addition to these corporations, sixteen state-owned tobacco companies are major cigarette manufacturers in specific countries. China National Tobacco Corporation is the largest state-owned tobacco company, producing more cigarettes than any other firm in the world: in 2008 it manufactured 2.1 trillion cigarettes, over a third of the worldwide total. Until recently, major companies often focused on consolidating and expanding cigarette market share, in part through buying smaller companies. A more recent tendency is to branch out into other tobacco products, such as snus (moist snuff). New technologies are also attractive; in 2011, for example, Philip Morris International bought patent rights to a technology that delivers nicotine-infused aerosol, while British American Tobacco established Nicoventures, a separate company devoted to creating less damaging alternative nicotine products. Revenues from the global tobacco industry are not known precisely, but the best estimates put them at around half a trillion dollars annually. According to the Tobacco Atlas, in 2010 the combined profits of the six leading tobacco companies—the five publicly traded companies listed above and China National Tobacco Corporation—was $35 billion, which was equal to the combined profits of Coca-Cola, Microsoft, and McDonald’s in the same year. The distribution of the revenues differs significantly by country: in Nigeria and Uzbekistan nearly three quarters of the money spent on cigarettes goes to the manufacturer, while in Japan and Finland about 70% goes to taxes. Thus, although tobacco is ultimately a national financial burden, it also provides governments with revenue. In countries with state-owned tobacco companies, profits as well as taxes flow into government coffers. In China, the tobacco industry contributes over 7% of the central government’s total annual revenue. As the Tobacco Atlas aptly puts it, “if Big Tobacco were a country, it would have a gross domestic product (GDP) similar to that of Poland, Sweden, Venezuela, or Saudi Arabia”. Tobacco advertising is also a huge business. Despite increasing restrictions on marketing and advertising, tobacco companies continue to spend billions of dollars annually to maintain brand loyalty among current smokers and to gain new customers, especially among young people. According to the Tobacco Atlas, “in 2008, $9.9 billion was spent on cigarette advertising and promotion in the US alone, and an additional $548 million was spent on smokeless tobacco marketing. This equated to more than $34 being spent on tobacco marketing for every man, woman, and child in the US that year.” In many countries, the mass-media advertising of tobacco is banned, forcing companies to turn to alternative marketing techniques to attract and retain smokers, including advertisements at the point of sale, allowances paid to retailers to facilitate product placement, promotions such as “buy one, get one free”, and price discounts. In the United States, price discounts, coupons, and retail-value-added promotions accounted for 83% of all tobacco marketing expenditures in 2008. Tobacco advertisement is now often done via the Internet and particularly social media sites. Large tobacco companies conduct research on local cultural norms to help promote their products. In one prominent example, British American Tobacco and Philip Morris investigated the Chinese culture of gift giving and subsequently marketed cigarettes as suitable presents. The map reproduced from the Tobacco Atlas (on the left) documents the efforts of Big Tobacco to advertise its products among the youth through placing logos on such items as T-shirts, pens, backpacks, and the like. Tobacco companies also spend millions of dollars annually to influence public policy and legislation. Exactly how much is spent in those areas is not known because the reporting of political contributions is not required in most countries. 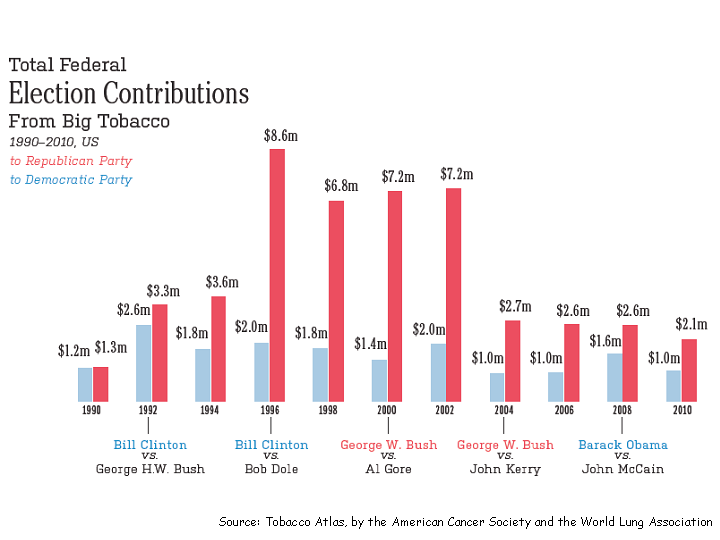 But in the United States alone, the lobbying expenditures of nineteen companies with tobacco interests was estimated at $16.6 million in 2010. 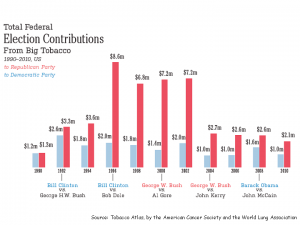 Of the two main parties, Republicans are the chief recipient of Big Tobacco’s funds, as can be seen from the graph on the left. Additional millions are spent on charitable contributions under the guise of corporate social responsibility; while such money goes to legitimate causes, it constitutes only a small fraction of the companies’ annual profits (less than 1%) but allows them to legitimize themselves with policymakers and the public. While tobacco companies insist that their business is essential for global and local economies, these benefits need to be weighed against both the direct the costs of tobacco to society, such as treating tobacco-related illnesses, and the indirect costs, including losses in labor productivity, littering, fire damage, environmental harm from farming practices, and the intangible suffering of the victims and their families. Studies commissioned by the industry claim that early mortality from tobacco use eases the financial burden on public pension funds—by this logic, prevention efforts against HIV/AIDS, cardiovascular disease, tuberculosis, cancer, or diabetes have negative effects as well. As with many other aspects of the tobacco industry, the exact costs of tobacco-related illnesses are hard to estimate. 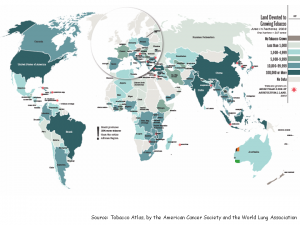 Because of the limited or poor-quality data, the dearth of research funding, and the absence of research capacity over much of the world, tobacco-related health-care costs have only been calculated in a few countries (see map on the left). These figures are related to both the number of persons being treated for tobacco-related diseases, which depends on the given country’s demographic characteristics, and on the cost of treatment, which depends on the country’s health system. 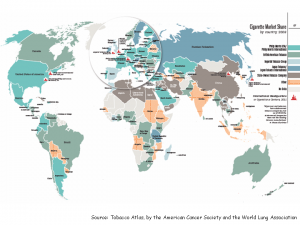 As health systems of low- and middle-income countries develop along with their economies, the medical costs of tobacco-related diseases are predicted to grow. Proportionality, Egypt and Mexico spend the highest proportion of their health-care funds, over 10%, on treating tobacco-related diseases, despite their relatively low levels of cigarette consumption (especially in Mexico, which ranks 111th globally). 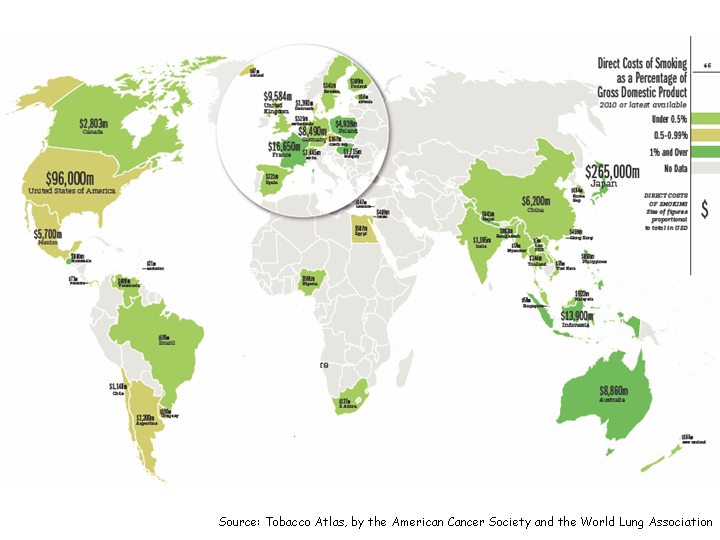 The United States and China spend 4.5–5% on tobacco-related health care, while Finland spends less than 2%. 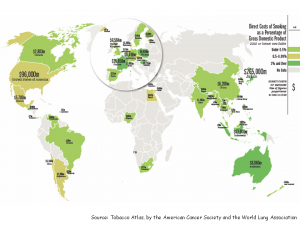 Though the percentages may not seem particularly high, the absolute figures are staggering: according to the Tobacco Atlas, the direct costs of tobacco in the United Kingdom, which spends 4.6% of its health-care funds on treating tobacco-related diseases, amounted in 2008 to US$9,584 million, enough to pay for the services of the transportation department. The money that Chile devoted to tobacco-related health-care in 2008, US$1,140 million, would be enough to cover the country’s public safety program, whereas the sum spent by New Zealand in 2004, US$166 million, equals its annual expenditure for school construction. Given the scale of legal tobacco industry, it is unsurprising that it spins off an illegal branch. 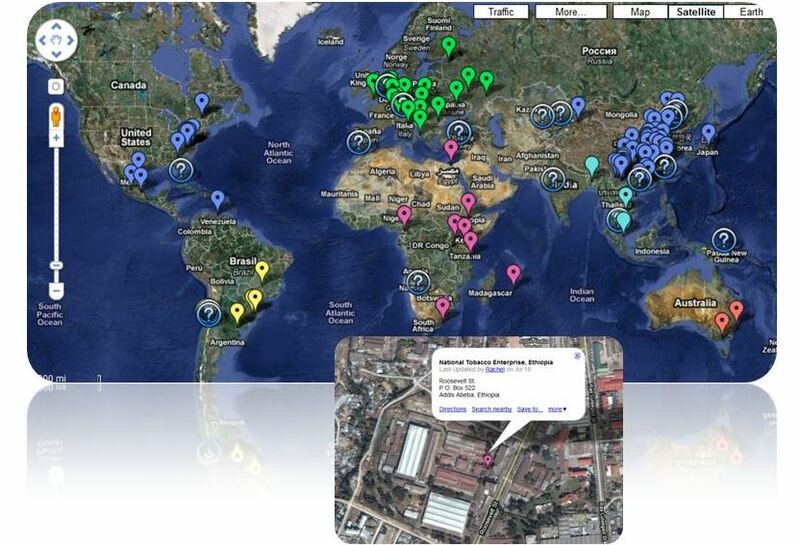 The share of the illicit cigarette trade in the global market is estimated at 9–11%, or $50 billion annually. According to the Havocscope website, an estimated 65.5 billion illegal cigarettes are sold in the European Union each year, bringing approximately $6.5 billion per year. Illicit cigarette trade appears to have remained relatively stable since 2000, even though some developed countries, such as United Kingdom, have managed to reduce the penetration of contraband cigarettes within their markets. Countries in the low- and middle-income categories typically have large illicit tobacco sectors. For example, in Cambodia the share of the illegal tobacco trade in the country’s cigarette market is as high as 30%, whereas in Vietnam, the black market makes up 18-22% of the total tobacco trade. In Libya, over three quarters of cigarettes smoked in the country are reportedly smuggled and bought on the black market. Moreover, the illicit tobacco trade in poorer nations is growing; in Costa Rica, this segment grew by 19% in the last year. Up to 18.6% of all tobacco consumed in Greece was purchased on the black market, an increase from 7.3% at the end of the year 2010. In Pakistan, 23.5 billion illegal cigarettes (i.e. 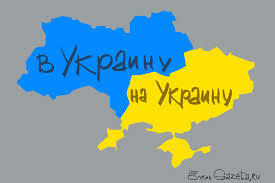 cigarettes that avoided tax payments, were smuggled into the country, or were counterfeits) were smoked in 2012. The illicit trade in tobacco products has serious health, economic, and social implications. As it is left outside the realm of youth-access laws and mandatory warning labels, its negative health impact is heightened. 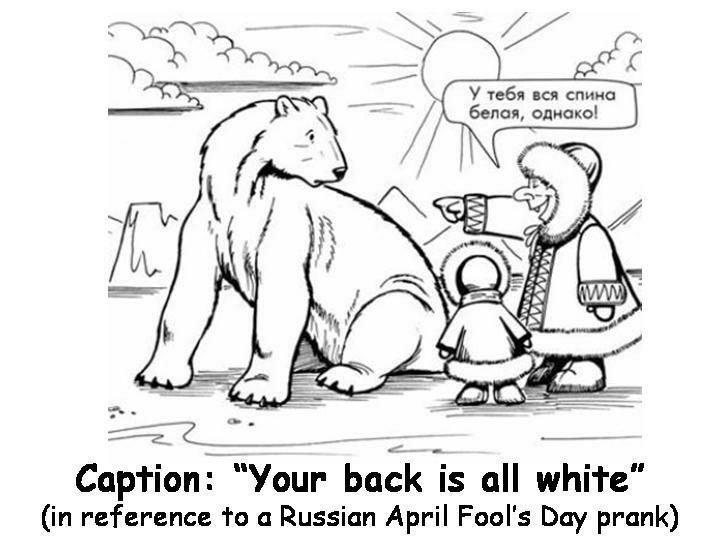 It also has serious political implications. According to the World Health Organization report, “smuggling of cigarettes gives opportunities for organized crime networks to survive and may increase the general level of corruption in a country”. Moreover, circumventing tobacco taxes undermines state tax revenues and price policies. According to Havocscope’s estimates, the annual tobacco tax losses from the illicit trade in the United States alone amount to $10 billion. Despite its recent progress in this area, the government of the United Kingdom still losses up to $5.4 billion in tobacco tax revenue each year due to smuggling activities. 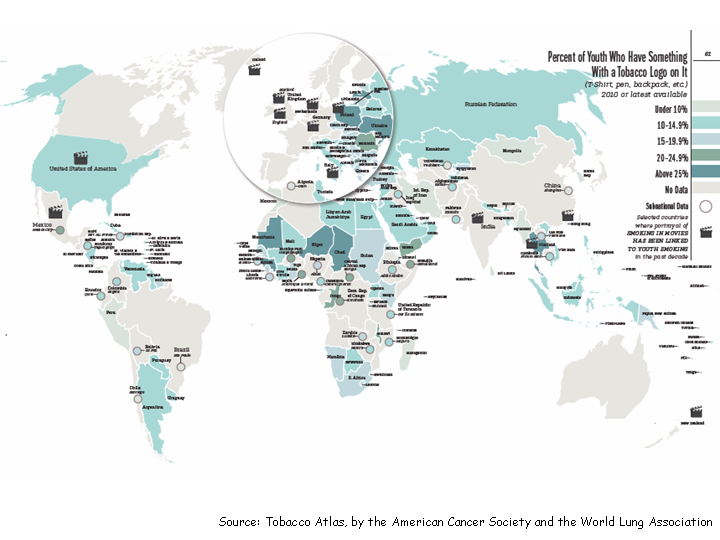 On the global scale, the Tobacco Atlas estimates, “if illicit trade were eliminated, governments worldwide would gain at least $31.3 billion a year in tax revenue, and from 2030 onward, more than 164,000 premature deaths would be avoided annually due to higher average cigarette prices”. The black-market cigarette trade is highly profitable. Criminal gangs in Ireland reportedly purchase counterfeit packs for as little as $0.26 (€0.20) and then sell them on the black market for $5.87 (€4.50); the average price of a legitimate pack of cigarettes sold in retail stores in Ireland is $12 (€9.20). Illicit tobacco is profitable not only for the criminal intermediaries but for the transnational tobacco companies as well, as it allows them to circumvent tobacco taxation. The tobacco industry has consistently argued that heightened tax increases create more illicit trade, but evidence for such claims is slim. In fact, evidence shows that factors other than tax and price are more important determinants of the illicit tobacco trade, and that the black market generally decreases where cigarette prices are higher. Other policies that can decrease the illicit trade include licensing all participants in the tobacco business, introducing enhanced tax stamps and higher trafficking penalties, and tracking tobacco product packages.